Our latest Project Gutenberg release, produced with the help of Distributed Proofreaders, is an early novel by Mrs. Alex. McVeigh Miller, The Senator’s Bride. Written before she achieved widespread popularity with The Bride of the Tomb, but published later, this shows what sort of novels she might have written if financial needs had not led her to pursue a career writing sensational melodramas. It is also one of her most personal works — a story about losing a spouse and child, written not too long after illness had claimed the lives of her first husband and baby. That historical context should not lead the reader to believe that this novel is completely without sensation or melodrama, or that it gives a particular deep insight into its author’s psyche; Mrs. Miller was clearly stronger at creating convoluted and surprising plots than she was at conveying emotional depth. However, there are obvious echoes of her life to be observed if you are familiar with her biography, like an interesting tribute to another popular story paper novelist, Mrs. E.D.E.N. Southworth, who Mrs. Miller visited early in her career, and whose home is pointed out as a significant landmark by a character in the novel. The book also shows — through an overtly racist subplot involving an unfailingly loyal ex-slave, and through its portrayals of former Confederate soldiers — some of the ways in which Mrs. Miller, and presumably many other Southerners of the time, tried to conceptualize the aftermath of the Civil War. 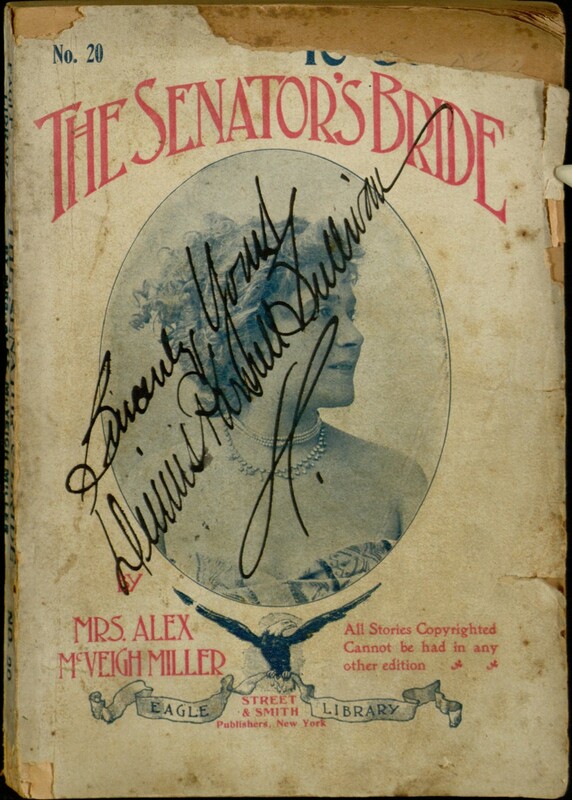 The Senator’s Bride is also noteworthy as Mrs. Miller’s only novel to have a direct sequel — The Senator’s Favorite — written many years later, and likely to be presented here in a few months. Stay tuned! In the meantime, the first novel can be read in its entirety or downloaded through Project Gutenberg.